River Ridge Campground is a private membership, exclusively male, clothing optional campground & RV Park, offering a 7 month season on a pristine completely fenced property along the Licking River for men of all backgrounds to relax, chill out and play. Activities include volleyball, canoeing, kayaking, fishing, horseshoes, potlucks, Friday night bonfires, naked movie nights, themed parties/weekends, soaking up the sun on the clothing optional sundeck or cooling off in the pool in the beautiful rolling hills of Northern Kentucky about an hour drive of Cincinnati, 50 miles N.E. of Lexington. Minimum age is 21 and Photo ID is required upon admittance. Amenities include: 40+ RV Campsites, Cabins, primitive tent sites, tent sites with electric and water, pull thru sites for Motor Coaches, 20/30/50 amp service,). City Water on all RV sites, Dump Station, & weekly pump-out service, WiFi now available throughout the whole park. Other amenities include a Day Lounge with big screen TV and morning coffee bar and WiFi, showers w/hot water and toilets & outdoor showers w/hot water as well. Affordable 7 month seasonal sites available along with winter storage. Have any new information on Kentucky gay camping? 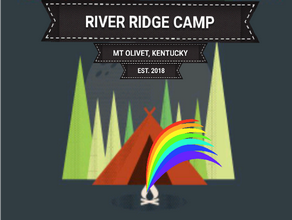 Know of any other gay campgrounds in Kentucky not listed on this site? Let us know - leave a comment below. © Copyright 2019 gaycampingusa.com. All rights reserved. Email infoATgaycampingusa.com.